All natural Nutella inspired fudge pops are a healthier way to enjoy this favorite childhood treat. Raw ingredients are poured into a food processor and blended until smooth and poured into molds. 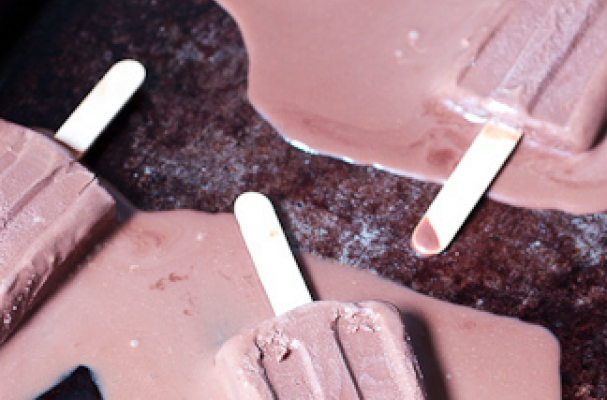 Since these frozen fudge pops are dairy-free, they are vegan too! Step 1: Preheat the oven to 400 degrees Fahrenheit. Place the ice pop molds in the freezer to chill. Step 2: Roast the hazelnuts for 8 to 10 minutes until just lightly toasted. Remove them from the oven and place into a kitchen towel. Rub the nuts together in the towel to remove the skins. Step 3: Place the nuts in a food processor or high powered blender and blend until smooth. Add the cocoa powder, frozen bananas, and nut milk until all ingredients are well incorporated. Next, add the salt, vanilla bean paste and syrup and pulse again. Taste the mixture and adjust seasoning if necessary. Step 4: Divide the mixture into the ice pop molds and freeze until set.